Tip (and mini craft project) of the day: prevent accidental unbuckling of your child's car seat! If your child's car seat is installed with a seat belt, chances are a well-meaning back seat passenger (grandma, your 6-year-old in her booster, perhaps even you!) accidentally unbuckled the seat belt holding the baby's car seat instead of your own seat belt. 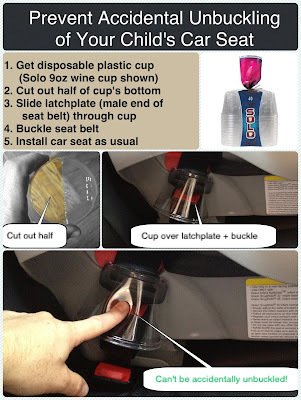 See how you can use a Solo disposable plastic or paper cup to prevent these accidents (but still allow access to the buckle in case of emergency). P.S. To those who want to cover the buckle with tape, please don't - it just makes a sticky mess and can interfere with proper use of the seat belt in the future. NOTE: Some cheap plastic cups crack very easily and actually present a hazard to your little one's fingers, should they play with it. The Car Seat Lady posted: The cups I use are the Solo cups which are quite heavy duty (same company makes the big red cups so often used for beer) - and have not had issues with them cracking. The cup I used is not a choking hazard (I'm a pediatrician, and am very aware of the dangers of choking hazards). I'd much rather a child's finger gets cut (which it won't the way I have designed this cup cover) than a child dies because the parent didn't realize the car seat had been accidentally unbuckled. LouJean Schenk posted: Awesome idea! Misty DeGroff posted: I would not do this as it could void out the warranty on your car seat. Any altercations or aftermarket things you use to fasten in or attach to your child's car seat voids out the warranty. That means if the seat was faulty, they will not pay any out of pocket and blame you for it failing. Morgan Adams posted: How could protecting the buckle possibly void the warranty? It would not be altering any part of the seat or even the seat belt, just adding a cap over the buckle so it can't be accidentally unbuckled. Heather Fisk posted: Not only that Misty, I'd be scared my kids would cut themselves on the half cut plastic. And who's to say they can't slide the cup up and unbuckle the belt anyway? Misty DeGroff posted: Anything you put on your car seat, even those toys that hang on the car seat or that Mighty thighty (the thing that tightens the seat belt you fasten the car seat in, with voids your warranty. Read your user guide.) They say any aftermarket thing you attach to your car seat, and/or seat belt, can affect your car seat and its ability to protect your child. Not only that, the cups can be sharp and over time could cut or fray your seat belt. Stephanie S. Leupold-Chastain posted: You might want to read the thing about using the silicone cupcake liners, Misty. Sharlene Whissell Koziej posted: This seems like a great idea, we found our little ones seat undone one day, hopefully not undone too long though, kids like buttons and will work hard it figure them out. That's what happens when you unload the car, while you think your kids are safe. We try to be super moms, but sometimes we need help too. Angela Waagen posted: I'm a firefighter, paramedic, and CPST [Child Passenger Safety Technician]. I'm also a mom to three. This is a super idea! To all the what if ers - in an emergency we would just slide the cup up, tear it off, or cut the belt. If someone's worried about sharp edges on the plastic I'm sure some masking tape would remedy that. Thanks for helping spread tips on child safety! Misty is correct. I'm also a CPS Tech & in NC we're clearly trained that any after market accessories that were not tested with a specific seat, can void the warranty. Some manufacturers will make after market accessories to go with their seats, but they will test those accessories with their seats & they are only considered safe when used with their seats. It is clearly stated in the instructions for proper use. This is a good thought, but in the end a parent has to outweigh the possibility of the inconvenience of an unbuckled car seat vs voiding the warranty. As for the cracking & possible small cuts from plastic, that can be avoided by placing duct tape around the outside of the cup if you chose to do this. You can also buckle the female end backwards so they can't get the button. ..
Why do so many care about the warranty? I have never had to take use of any of my baby/child warranties. I would rather have my child safely in his/her car seat then get the benefit of a warranty. Lives are much MUCH more important than money or materials. I think this is a great idea and I am going to do this. My son has gotten to the stage of unbuckling and it is so dangerous. This may just be the trick. Come on people....... think of what is more important! Who cares about the warranty when your child's life is at risk? Personally I'd rather have a living child than a valid warranty. Why do such a large number of think about the guarantee? I have never needed to take utilization of my infant/youngster guarantees. I would rather have my tyke securely in his/her auto then get the profit of a guarantee. I have never have my tyke securely in his/her auto siteuate then get the .. Lives are much more critical that cash or materials.